This November, several pro-government militia leaders elected in Burma’s widely discredited 2010 parliamentary poll are seeking a return to office on the ruling Union Solidarity and Development Party (USDP) ticket, a further reminder that guns still very much have a place in the country’s political arena. The recently finalized candidate list from the Union Election Commission (UEC) includes several such incumbents connected to militias that, while legal, are allegedly involved in Burma’s lucrative illicit drugs trade. Officially known in the Constitution as “people’s militias” (pyithu sit in Burmese), these armed groups have significant autonomy in certain parts of the country where, for many years, the central government has used them to solidify its rule by proxy. Burma is home to, by one estimate, more than 50 such militias; groups that are left to self-finance their activities through natural resource concessions, checkpoint tolls and, according to their critics, drug trafficking. As the country’s largest and most drug-plagued region, Shan State has proven fertile ground for these groups to proliferate, and with this in some cases has come the establishment of virtual fiefdoms, a development that critics say could not have happened without the complicity of their allies in the military. T Khun Myat, an ethnic Kachin from northern Shan State’s Kutkai Township, is running this year to retain his seat in the Lower House of Parliament, where he serves as chairman of that chamber’s Bill Committee, a body tasked with drafting new legislation and amending or repealing laws considered out of date. His role as head of the influential parliamentary committee is noteworthy as T Khun Myat has been identified as the leader of a Kutkai-based people’s militia in a special series of reports by the Shan Herald Agency for News (S.H.A.N.). The Thailand-based news group’s 2011 Shan Drug Watch report, “Druglords in Parliament,” accused T Khun Myat and his militia of being “involved in protection and transportation of drug shipments passing through” the group’s territory. According to the report, T Khun Myat is often described as a friendly and approachable fellow by those who know him. “Hard to believe he’s involved in drugs, if we didn’t know his subordinates,” the report quotes a field researcher as saying. A 2010 article also published by Shan Herald quoted a source from Kutkai claiming that T Khun Myat had been a shareholder in the now-defunct Myanmar Mayflower Bank (MMB). Leaked US cables obtained by WikiLeaks suggest that the US Embassy in Rangoon was highly suspicious of the bank: “MMB’s links to narco-traffickers, and their money-laundering activities, are indisputable,” wrote a US diplomat in 2005, shortly after Burmese government authorities ordered MMB and another bank shut down under a cloud of suspicion. The allegations against T Khun Myat and his militia, which have also been reported by the Bangkok Post and Al Jazeera, do not seem to have negatively affected the affable politician much, if at all: He remains chairman of the Bill Committee and in September 2012 led a parliamentary delegation to Washington, D.C., to take part in a weeklong governance training course facilitated by Johns Hopkins University’s prestigious Paul H. Nitze School of Advanced International Studies (SAIS). During the delegation’s visit to Capitol Hill, T Khun Myat and his parliamentary colleagues met then Senator Jim Webb, now competing to be the Democratic Party’s next US presidential nominee, and Republican Senator James Inhofe. The Kachin militia leader also took part in similar high-level parliamentary delegations that visited Japan in 2013 and India two years earlier. A descendent of a prominent Kachin traditional ruling Duwa family, the “T” at the beginning of T Khun Myat’s name appears to come from his family clan name Tangbau. It has been used to differentiate him from another well-known Kachin named Khun Myat Lahtaw, a businessman and hotel owner who helped negotiate a 1994 ceasefire between the government and Kachin Independence Organization (KIO) that has since collapsed. Another Shan State politician listed in the Shan Drug Watch report is ethnic Kokang-Chinese lawmaker Ho Xiaochang, a former deputy commander of the Kunlong Special Combat Police Force who is seeking re-election to his seat in the Lower House, where he currently represents Kunlong Township for the USDP. According to the report, Ho had enough influence while serving in the special police unit that he was able to personally appeal to then military supremo Snr-Gen Than Shwe to have a jailed subordinate freed just months after he was arrested for shooting dead a low-level customs official. Ho’s apparent negotiating skills could prove useful in what is expected to be a fractious parliamentary session following the Nov. 8 election. The official parliamentary biography of USDP cadre Wilson Moe, an ethnic Lahu from eastern Shan State, lists under career history his service as a senior member of an unnamed pyithu sit from 2002 to 2009. According to Shan Herald, this militia was the Nampong-Loi Taw Kham People’s Militia Force led by Yi Shay, a former lieutenant-general for the notorious drug warlord Khun Sa. Last December, Thailand’s Office of the Narcotics Control Board (ONCB) included Yi Shay’s name on a list of 10 drug suspects that the ONCB wants Burma to arrest. Wilson Moe is running again for a seat as a member of the Upper House in Shan State constituency No. 7. Another militia leader turned parliamentarian identified by the Shan Drug Watch report is Keng Mai, an ethnic Kachin and alleged chief of the Mong Paw Militia, who sits in the Shan State assembly representing Muse’s constituency No. 2. His election came following a campaign that, according to Shan Herald, involved serious intimidation. “Voters are frightened by his words,” an election watcher from the Sino-Burmese border told the news group in 2010. “They are worried if they don’t give the votes to the party, they might be in trouble when the elections are over,” the unnamed individual added. It remains to be seen how his parliamentary bid will go this time around, with Keng Mai now facing more opponents and an electoral environment subject to much greater scrutiny by civil society groups, political parties and the international community. In 2010, Keng Mai went up against three competing parliamentary aspirants, while this year he faces four including the opposition National League for Democracy (NLD), which has not shied away from raising alleged electoral malfeasance in the first month of the official campaign period. Though not a member of the USDP, one paramilitary leader turned sitting lawmaker has already resorted to strong-arm tactics in neighboring Kachin State. On Sept. 22, longtime Kachin militiaman Zakhung Ting Ying wrote a letter ordering NLD candidates not to campaign in areas under the control of his New Democratic Army–Kachin (NDAK), a group that officially transformed into a Border Guard Force in 2009. Following a formal complaint from the NLD, the state’s election subcommission intervened to allow the opposition party’s candidates to campaign in the area known as Kachin State Special Region No. 1. It remains to be seen if Zakhung Ting Ying will actually allow a free and fair vote to take place in a remote corner of Kachin State that has long been his personal fiefdom. 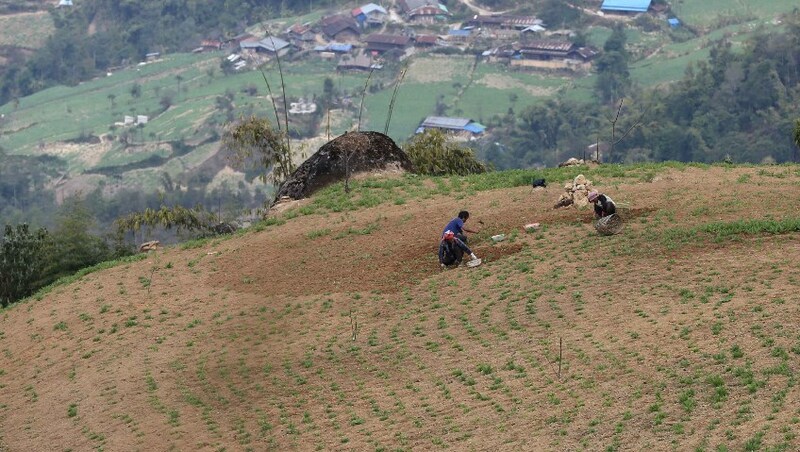 Three farmers cultivating poppies in an area under the control of the Pansay militia in Shan State. Elsewhere Myint Lwin, elected in 2010 to the Shan State assembly for a seat known as Kutkai constituency No. 2, is an ethnic Kokang-Chinese identified by Shan Drug Watch as yet another USDP politician involved in the drug trade. A longstanding member of the pro-government Ta Moe Nye militia, Myint Lwin is closely connected to the leaders of two other Shan State militias that emerged from Khun Sa’s once powerful Mong Tai Army and were “heavily involved in drug production and trade,” the report said. A subsequent Shan Herald article described Myint Lwin as head of the Ta Moe Nye militia, as did a 2012 report from the Transnational Institute (TNI), which noted that he controls a firm with a similar name, Ta Moe Nye Chan Thar Company, and is heavily involved in the resource extraction sector in Shan State. Those business activities, according to TNI, appear to have benefited from Myint Lwin’s close ties to former junta strongman Than Shwe, a relationship that began in the 1970s when the latter was stationed in northern Shan State. The Kachin ethnic affairs minister for Shan State, Duwa Zot Daung, was elected to his position in 2010 on the USDP ticket. According to a recent report by the Asia Foundation, he is linked to the Mongko (Moneko) Militia, another group active in northern Shan State, by way of his son Naw Hkam, who reportedly commands the group. Duwa Zot Daung is again running for the ethnic affairs post in November, but this time as an independent. While at least five sitting USDP lawmakers with ties to militias are set to recontest the Nov. 8 poll, others appear to have opted to forgo a shot at parliamentary politics this time around. Kyaw Myint, head of the Pansay militia and sitting member of the Shan State parliament representing an area that includes his northern Shan State fiefdom, is not listed as running again for his seat in Namkham Township. A report released by the Palaung Women’s Organization (PWO) in October 2011 alleged that Kyaw Myint and his militia were heavily involved in the drug trade. “Now militia leader Kyaw Myint has become an MP, he has more power to deal in drugs,” PWO warned in a press statement coinciding with the release of its report. Kyaw Myint’s militia was also named in the 2011 Shan Drug Watch report, allegations that were repeated by local villagers during a visit by The Irrawaddy to Namkham earlier this year. Ethnic Palaung anti-drug activists told an Irrawaddy reporter that the territory of Kyaw Myint’s Pansay militia covered 20,000 acres, stretching from the border town of Muse to Kutkai some 30 kilometers to the south. It appears that Kyaw Myint, whose militia has often fought alongside Burma Army units based in Shan State during clashes with the Ta’ang National Liberation Army (TNLA) in recent years, may be too preoccupied fighting to maintain his group’s territory to run for office again. Since 2012, the TNLA has waged a self-described war on drugs that has seen its soldiers repeatedly raid areas under the Pansay militia’s control to destroy poppy crops. Liu Guoxi is another sitting USDP lawmaker listed in the Shan Drug Watch report who does not appear to be running for his seat in the Upper House constituency of Shan State-11. The former Burmese Communist Party official, who after that group’s collapse was secretary of the Shan State Special Region No. 1 in Kokang, was described by the Hong Kong-based Far Eastern Economic Review as a “drug kingpin” in the 1990s. He was also mentioned in the US State Department’s annual International Narcotics Control Strategy Report from 1999 as someone believed by the US government to be involved in the drug trade. Liu was awarded his seat in 2010 after running unopposed. According to Shan Herald, Liu’s relative Zhao Dechang, who allegedly served as a “member of the cartel set up by” Liu, was elected to the Shan State parliament in 2010 after also running unopposed in the constituency of Kongyan No. 2. He is running again under a Burmanized version of his name, Kyauk Tae Chan. The current Kokang Special Region chairman Bai Souqian, who was elected in the 2010 election from Laukkai constituency No. 1 after also running unopposed, is absent from the UEC candidate list as well. Bai, whose home in Laukkai was reported by state media as having been shelled during clashes in February with forces loyal to his former comrade Peng Jiasheng, was described in the 2011 Shan Drug Watch report as someone involved in the drug trade. It appears that he does not actually need to run for his office in order to maintain his position as chairman of the Kokang self-administered zone, a post appointed by the central government. As of January 2013, Bai Souqian’s son Bai Yingneng was serving as the USDP party secretary in Kokang, and it would appear that he hopes to follow in his father’s footsteps; an individual named Bai Yingneng (listed alternatively as Khin Maung Lwin) is slated as the USDP candidate running for a seat in the Shan State parliament to represent the constituency of Laukkai No. 2. All bets are off on forecasting the outcome of Burma’s highly anticipated general election, but this much seems certain: The interplay of guns, drugs and power will—as it has for decades—continue to factor into Burma’s political milieu. Editor’s note: T Khun Myat has also been spelled Ti Khun Myat, T. Hkun Myat and Khun Myet. Ho Xiaochang is also known as U Haw, Haw Laosang, Haw Shauk Chan and Haw Kwan. Yi Shay is also known by the Thai name Chaiwat Pornsakulpaisarn. Keng Mai has also been spelled Kein Maing. Myint Lwin is also known as Wang Guoda and Wan Kwe Tar. Kyaw Myint is known also as Win Maung and Li Yongqiang. Liu Guoxi is also known as Hlyu Kwe Shi and Lu Kwet Shu. Bai Souqian is also known as Pei Hsauk Chen, Pae Sao Chein, Pei Sauk Chein, Bay Hsaw Chei, Phe Xiao Chain and Bae Saw. Top Photo - (Reuters ) Bai Souqian, identified in this Reuters photo as Phe Xiao Chain, speaks to journalists in Laukkai, capital of Burma’s Kokang Special Region, on Sept. 8, 2009.